I list and sell land parcels in Arizona. 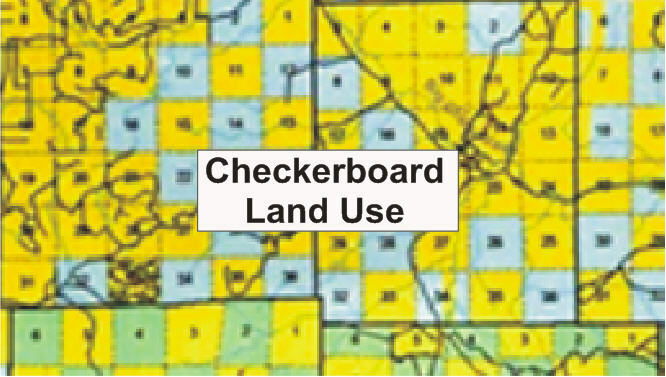 I am often asked why the development occurs in a checkerboard land use pattern. 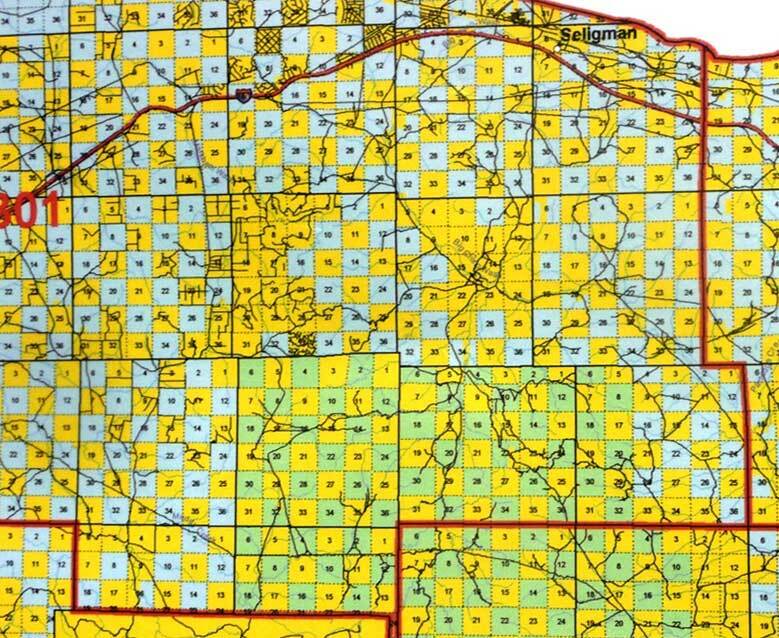 This example map shows an area southwest of Seligman, Arizona that is a checkerboard land use pattern. In this map, the yellow sections are private land, the blue is Arizona State Trust Land, and the green designates land in The Prescott National Forest. There is no BLM land in this area. When the railroads were being developed, the railroads were given twelve square miles of land for each mile of track that was laid. The railroads were not given the land in contiguous tracts, but were given odd numbered sections only. This checkerboard land pattern of land use exists in many western states. In Arizona, at least in some areas, the remaining land eventually was given to the Arizona State Land Trust and was initially for the benefit of our school systems. Income for the schools is still derived by grazing leases of these lands. In the areas with the checkerboard pattern still intact, the public land provides around 50% open space. Much of the privately held land, which was originally held by the railroads, has been developed. In the Seligman, Arizona Area, many of these sections were divided into lots of 36 acres or slightly more. Those parcels with borders against the public lands are desirable because of the sections of open space. Very few of these parcels are fenced, so the area is mostly open range. There are three major developments of this type southwest of Seligman. These are The Sierra Verde Ranch, Shadow Rock Ranch and Juniper Mountain Ranches. Elevations range from around 5,100 feet to about 6,200 feet. As of the time of this writing, the number of dwellings run about three to five dwellings per square mile and most of these are getaways and not permanently occupied. Please see my Frequently Asked Questions about Bug Out Places. Arizona State Trust lands are not “public lands”, as are Federal lands under the management of the U.S. Forest Service or the Bureau of Land Management. Federal “public lands” are managed for the benefit and use of the public, while State Trust lands are managed for the benefit of 13 Trust beneficiaries, which include the public schools and prisons. The Land Department’s trust management responsibilities include requiring a permit or lease and charging a fee for use of Trust land. Exceptions to this requirement are licensed hunters and fishers, actively pursuing game or fish, in-season, and certain archaeological activities permitted by the Arizona State Museum. The Arizona State Land Department has a webpage describing the Permits they offer. 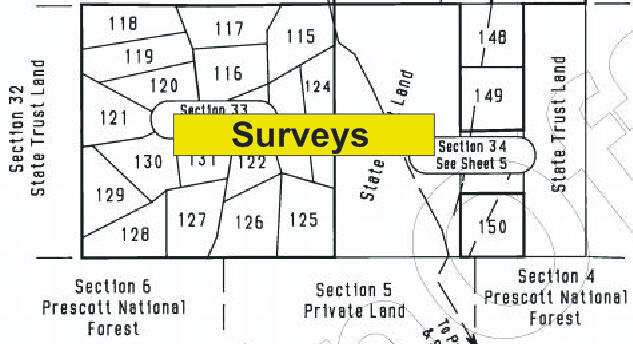 There is also a page summarizing the uses of Arizona State Trust Land. A portion of The Prescott National Forest (PNF) includes an area that is in a checkerboard pattern. In the map below, the sections belonging to the PNF are in green. Some of this is in an area designated in The Yavapai Ranch Land Exchange and an elaborate land swap has been approved by the US Congress. 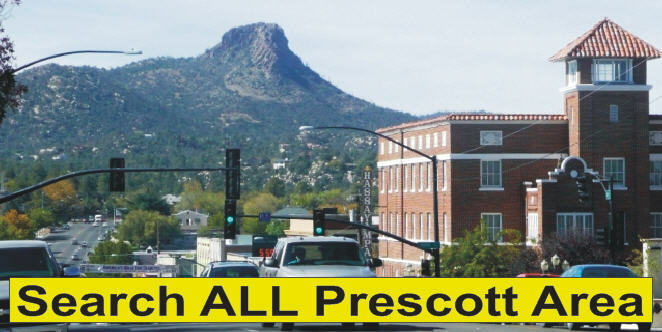 This land swap will result in part in making this portion of The Prescott National Forest contiguous and in making other sections of land outside the PNF contiguous, as well. The Yavapai Ranch Land Exchange is in the stage of gathering appraisals. Please see my map of this area showing properties that are for sale. I have many listings in the Seligman Area, as work in the area gives me a chance to get out of the office and to see the sights and watch for animals. My listings are summarized on my Properties Page here. to meet him. Learn more about Beau here.